BBC NEWS | UK | England | England's most patriotic town? The banners, flags and bunting went up weeks ago, and across the market town of Morley in West Yorkshire, residents have been holding their biggest St George's celebrations to date. Not content with flying the flag for just one day, an entire weekend was given over this year to celebrating England's national day. The programme of events alone stretched to three pages long, and 10,000 were distributed to schools, shops and homes to encourage people to join the show of patriotism. In the local park, the England flag flies high, and flowers in the colours of the St George's cross have even been planted in a nearby flowerbed. On Sunday, hundreds of people watched St George riding on horseback through the town, leading an annual parade, followed by a longbow competition at the town's rugby club. So is Morley England's most patriotic town? Local resident Paul Cockcroft, 41, who helped to organise the weekend festival, is certain it is. "As far as I know, we have the largest event of its kind in the country," he said. "That was what we were aiming for. "A month before the event, we had the whole town covered in bunting from head to toe, so it looked like VE day. "When people came into the town and saw all the bunting, they stopped their cars and said, 'what is going on here?'" Mr Cockcroft said organisers believed about 10,000 people had visited the town during the weekend of patriotic celebration. 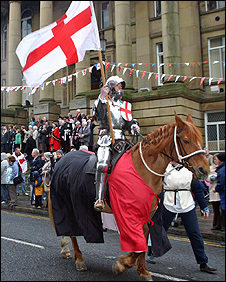 "It shows the sense of passion that people have for celebrating St George's Day," he said. 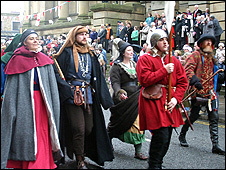 Joe Tetley, chairman of the Leeds branch of the Society of St George, said Morley was committed to holding the annual festival, which began in the town five years ago and has grown in size every year. He said: "Irish people go crackers on St Patrick's Day, and the Scottish are the same. It's just a case that we think St George's Day should be celebrated. "I think people have suddenly realised we don't have a national day, so we have started bothering about it and putting it forward. "Events like we have had in Morley have really taken off. "Local people have said it is the biggest event they have seen in Morley since the Queen came in 1954." The town was intensely proud of its festival and had resisted offers to move the events to the neighbouring city of Leeds, Mr Tetley added. "It is a Morley event and it stays in Morley - that is non-negotiable," he said. Our village school PTA has organised a St.Georges day festival for the past 3 years. It has proved very popular, starting with a blessing at the church then a fancy dress parade lead by St.George through the bunting clad village to the school. The theme is anything English. This years entrants included a Punch & Judy show and a bag of fish and chips. This is a great event that the whole community gets behind. Congrats to Morley for celebrating St George's Day, there's nothing that I know of happening in Manchester, there seems to be more celebrating going on at St Patricks day (St guinesses Day) than our own St, maybe that cause he has no beer linked to him. Speaking as an irishman well done morley. spent 2 yrs in london and could never figure out why u guys didnt celebrate your nationhood just as we irish do. The celebrations in Morley certainly look great. I have heard absolutely nothing about local events in our area . It's sad that we don't do anything for St Georges Day, in fact we get more excited about St Patricks Day (possibly because it's sponsered by alcohol) than we do about St Georges. We need a good alcoholic drink to get behind it, and less cringeworthy connotations currently associated with the St Georges flag (every time I see it I instantly think racist!) and perhaps we can enjoy ourselves and our beautiful country! Romford town puts on some big St Georges celebrations. The historic market is full of bunting and flags, as well as the Romford Drum & Trumpet Corps playing live and a John Bull character greeting locals! Pie & Mash is the meal of the day and the Golden Lion pub is holding a Beer & Ale festival this week too. Very English - come and join in! I wear a red rose every year on St.George's day and show the flag of St.George at my window. St.George is also the patron saint of Scouting and the Scout Movement of which I am a memeber, also recognises his day. In Folkestone,we hold a Service and Parade on the Sunday nearest to the 23rd April. Here in Newington we are holding a traditional village fete in the school grounds from 2pm on Saturday to celebrate St George's Day. The children will be having a fancy dress competition and will be decorating shields. This will be followed by an English Folk music concert in the evening. ALL ARE WELCOME!